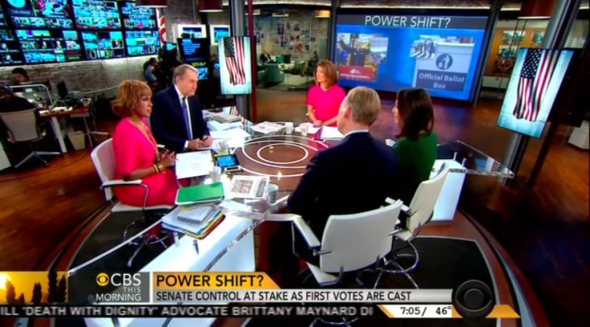 On Tuesday, the analysts on CBS This Morning did their best to downplay the significance of a potential GOP-controlled Senate in this year’s midterm elections. Unlike ABC and NBC, who provided mostly straightforward coverage of today’s elections, CBS made sure to push the line that regardless of the outcomes, the election was an indictment of both political parties. The electorate is angry, it’s frustrated, its sour. What if a lot of them just don’t turn out? We’ve been talking about this is a base election. If the number of moderates, people who identify themselves as moderates is very low, then we’ll know that people looked at this they just got sick of it and they said I’m going to do something else other than vote today… Well, you talk to voters they say nothing’s going to change in Washington even if control of the Senate changes. CBS did a poll and they asked the questions this election about Barack Obama, for him or against him? And a plurality said it’s not about Obama at all. In the work that we’ve done it’s actually anti-Washington votes. It’s an anti-incumbent vote. 1. What type of bias did CBS This Morning display in the election coverage excerpted below? 2. Why do you think CBS chose to portray a potential Republican victory as an anti-incumbent vote–a result of dislike for both political parties–rather than support for one political party over another or votes against President Obama? 1. CBS This Morning displays bias by spin by reporting a potential victory for Republicans as anti-incumbent, rather than a mandate for Republican governance. 2. Opinion qestion. Answers vary.